With the season approaching its ‘sharp end’, there are still at least seven teams (arguably as many as 11) of the 16 in National 1 who still need every point in order to achieve their annual objective, be it glory or survival. The result is that virtually every game assumes a greater importance in the minds of players, coaches and fans. This week’s home fixture with Henley Hawks is very much in that category. After an indifferent period through December and early January, Hartpury appear to have steadied things somewhat in the past couple of weekends, collecting 109 points in wins over Blaydon and Cinderford, albeit opponents who are battling at the ‘wrong’ end of the table. Saturday sees another, similar, challenge. Visitors Henley have everything to play for as they seek to survive in National 1 and break out of their yo-yo pattern of the past few seasons. The Thames Valley side did themselves a power of good in that respect last time out, producing a strong second half performance at home to Loughborough Students and turning a 3-14 half-time deficit into a 25-19 victory. Their early-season form did not indicate the struggles that lay ahead. When Hartpury visited Dry Leas in Round 7, Henley had won three and drawn one of their six league fixtures. However, perhaps something in the Hartpury performance that day affected their psyche. Having been held to a narrow 3-0 lead at the interval, the College cut loose in the second half with Jonas Mikalcius, in particular, enjoying himself with his first four-try haul of the season (pictured). The final score was 46-0 and, since then, Henley have won just twice in 12 matches. Loughborough aside, their other win came over fellow strugglers Cinderford, 27-13 at home in December. Unless Loughborough and, surprisingly, Ionians somehow contrive to slide back into the relegation picture, the equation appears to be a simple three from four. Of the teams in question, Cinderford clearly have the toughest task whereas Blaydon have the comfort of games in hand and the knowledge that they remain tough to beat at home. Of course, that might be easier said than done. 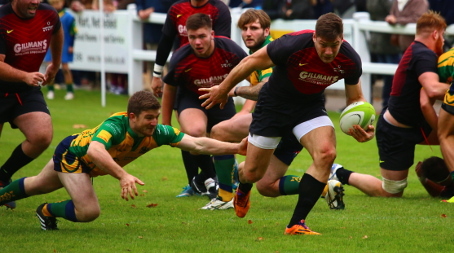 Six points behind leaders Richmond and level with Blackheath – who have a game in hand and a better win percentage – Hartpury know that they cannot afford to leave anything ‘on the field’ this week as they seek to stay firmly in the promotion picture. Richmond should be too strong for Cinderford, although the Foresters might draw some inspiration from their phenomenal win at the RAG last season. Blackheath travel to picturesque Wharfedale, but one imagines that they will be sufficiently pragmatic to ignore the scenery and focus on the result. Esher lost at home to Plymouth last week, their second loss in succession, and both sides remain distant outsiders as far as promotion is concerned. Plymouth host Blaydon, who must be relishing the 800-mile round trip (perhaps they’ve left already) while Esher travel to Hull, in a game that’s difficult to call. Mowden Park are just too far outside the frame to be considered promotion hopefuls, but they are certainly the division’s form team with the current run standing at 10 straight wins. It will be interesting to see how they handle Loughborough on the rubber crumb – particularly as they are Hartpury’s opponents in Week 22. Four teams who, win or lose, will be in National 1 next season meet in the two remaining fixtures as Fylde host Coventry and Rosslyn Park travel to Ampthill.